A great workshop on Tantra for beginners and experienced practitioners. Mal presents the ideas, concepts in a fascinating way, makes you think and invokes thought processes. Mal provided good answers to complex questions that we all had. A very enjoyable evening. A Great Teacher & Master who shares his honest experiences, wisdom , and his Tantric Journey with all students. Namaste. Thank you. Where should I start.... 7 days retreat in Thailand. When I arrived I never thought it was possible for a group of people to be transformed in just 7 days. I arrived on my first day sure that I knew what took me there and left sure that wasn't the reason I went. I was able to let go of what I thought and now concentrate on the real issues. It's been 5 days now since it ended and as crazy as it may sound I was really detoxified, I feel that fear, anger, sadness have left my body and expanded my brain to be able to get more information, the reason I'm saying this is because after 3 days I started a course and feel I have more space or more knowledge, ok the way I see it is, because all the other emotions were removed , it left me with space to concentrate on positive things. I would recommend this course to everybody but you have to be ready to experience all the emotions you have been hiding from. I wish you all a great journey and hope you can all gain from it as much as I did. Mal and Kate did a wonderful job holding the space and sharing their knowledge and experience. Despite the many question asked and time taken during the sharing sessions, they managed to finish the curriculum as per the schedule. No matter the situation, they handled it professionally. I acknowledge and respect both of them as my teachers. I was feeling a little apprehensive when I arrived for module two as I am still quite new to this specific approach to healing. When I found out that we were a very small group I was even more worried as there was now no where to hide, so to speak. But it was a very insightful four days, during which I experienced a whole range of emotions, I gave two treatments, one went well which accumulated with my \'peer-client\' releasing, the other was challenging as it was on the last day and I felt too drained to hold an appropriate space, which understandably irritated her. It was though the second one from which I learnt the most. I also received a wonderful treatment during which I experience energy flowing throughout my entire body like I have never felt before. I am going to continue the training as I love Mals work and his loving approach. Despite feeling challenging emotions, I always felt safe and the two assistants were wonderful. I will be back for more, both as a receiver and a fledgling practitioner Yours truly, a satisfied new student. I attended a Tantra taster evening and was pleasantly surprised by the exterior of the building as well as the interior. So much effort had gone into making the environment a safe haven where someone can truly relax and get in tune with oneself. The evening was very informative. Mal was a good speaker and held space very well. He had a good depth of understanding on tantra and made learning very simple. It was easy to sit back and know you were in good hands. Listening was a breeze. The lecture itself went into great detail and I gained the impression there a huge deal covered. I rarely had to question what was going on. The Power point slides were laid out in such a superb way. Viewing them was rather straight forward. I had one query at the end which Mal could answer easily and I left knowing that my understanding of tantra had improved. Refreshments provided at the end of the talk made everything I had been listening to throughout the evening that much more digestible (pun intended). I\'ve had so many takeaways from this workshop, and it was only the Module 1 which lasted two days. So I\'m looking forward to attending Module 2 very much. Mal\'s teaching is straightforward, knowledgeable, patient and nicely paced. He delivers it with love, passion and kindness all of which were tangible. The Temple is very serene and evokes feelings of ease, relaxation and safety. There were other members of his team present and they were all great and added much love and support to the overall setting. Also, accommodation was top notch and there is nothing left for me but to highly recommend this course to anyone who feels drawn to it. I feel love, gratitude and appreciation for being there, and will definitely come back for further work and study because these things are invaluable to anyone on the path of a healer. Very interesting and intense training course about how to heal traumas using very specific massage Technics introduced by MASTER MAL. Having myself very deep traumas since my childhood and having seen many professionals without any result ...I highly recommend this tantric journey school. Professionality, trust, acceptance - those three words sum up the quality of the training provided by Mal. He is an excellent teacher with an remarkable ability to explain and present, which makes the learning enjoyable and easy. We had a lot of opportunities to practice, as each presentation was followed by a detailed practical massage session. As a trainee, I felt that I was very welcome to ask questions, ask for explanation. The venue is spacious clean and cosy, making the training period a money\'s worth journey in the world of Tantra. Dear Mal, thank you very mach for your dedication in your mission. I\'m glad that I can become T.Therapist. I highly recommend Mal workshops for all people interested in Emotional Detox & Tao Tantra. No other workshop has been able to change so much in just a week - and i attend over 100 of them. Complete strangers become brothers and sisters, form almost physical bond and sense of a commitment to transform ( ease ) the lives of others. Mal and lovely Kate showed us how they can transfer love to release the negative emotions we all suffer. Kudos to Mal who transformed the emotional treatment to a mystical dance - transfer of pure, warm love to release the negative emotions of the person beside him. Such a grace, intimacy and the heart full of love. The sessions seemed like a transfer of a divine, healing love. The effect of the workshop will last forever - I guess - to all of us. Every time when i hear the songs of Snatam Kaur or Deva Premal shifts me back among brothers and sisters and I feel secure and loved - as during the sessions we had. Love and respect. The location of Tao Garden Center is just perfect for this work. So much beauty and amazing trees and plants and so full of Chi. This on it\'s own invites healing and relaxing. I loved the diversity of the group, coming from 16 different nations, different ages (21 till about 70), different backgrounds and coming together with the purpose to release, to expand, to grow, to be of service to each other, to be honest and willing to connect deeply with each other. As I am used to work with energy and spirit I tend to be not so grounded. I also realized that because of some spots of tension in my muscles, energy can\'t move really freely and there is a limitation of embodying spirit all the way through to all levels of my human expression. In my path it is all about not separating spirit and matter anymore but being a living example of a body full of spirit and spirit expressing through an open body. I very much needed to leave my comfort zone to be able to participate fully and this is what I did. Mals open hearted presence and his 20 years of experience made it very easy for me to open up and to expand my capacity to connect deeply with my body, including physical and emotional pain and also with other people in the group. This week definitely brought expansion for me in many areas: I feel much more present in my body, I learned a lot, I found new friends, I have more to offer to my clients.... I am so grateful for everything. Mal led us with sensitivity, humour and deep personal knowledge to offer the gift of yoni massage and receive the healing of prostrate massage in a cubicle of unconditional love. At the end of a week, a bevy of strangers made such loving and supportive connections We were all changed, enlarged and nourished. Tantric journey is a profound way to both give and receive healing on a bedrock of the strongest power in the universe- love. Mal is amazing. After much experience, he has developed this art of touch. Sometimes soft as feather and other times hard and determined to release emotions. I like him, simple person with a smile. He’s always got lots of patience to hear you and will find a reply. The temple or place of therapy is beautiful and full of art, paintings and sculptures. Underfloor heating, advanced lightning, so you’ll feel welcome for sure. It has been an astounding discovery for me about the potential of the human body and the therapeutic dimension of this massage at the body workshop. It takes the presence of practice, feel and company blending energy polarities in order to continue learning from yourself. For me - it is continuing to explore and to achieve a deeper sense of joy. Thank you to Mal and Kate for sharing this experience. I had practiced a few wellness massages and received many Ayurvedic massages. Firstly I enrolled at this emotional detox training to discover something new and also to accompany my husband (Ayurvedic practitioner). I did not know exactly to what to expect at the program and also what to expect in the sense of practice not knowing what sort of feelings await me. Moreover I have not mastered the English language (understanding different accents) as the workshop required you to be integrated into a group and I thought my lack of English experience would become a hindrance – but surprisingly it did not. The program is proposed by Mal and accompanied by his assistant Kate was both gradual and sustained and allowed confidence building. I have deep respect for what he is and for what he can give his time to work and grow on in this environment. Also the group and its dynamics were comforting and the most ideal to make me feel that I fitted in. The first day was to help understand Emotional Detox through Bodywork that was followed by a live demonstration with appropriate techniques and movements! I always had a psychological approach to emotions (training, therapy), I always imagined how emotions can enroll in cells, nesting in and bursting like a Pandora's box. I received a massage for several hours by one of the participants. During the massage my energy floated and circulated throughout my entire body and in the pelvic area as a fireball that was expressed in different ways. The presence of this energetic fireball was both a great presence and a quasi-state of trance. I have never felt so much energy circulating in my body and around my body. I learnt as a receiver, I was able to relive emotions such as sadness, joy, anger and bring them out while receiving a Yoni massage. At the end of the massage, I felt both exhausted and an energetic transformation: I had totally let go and relapsed to feeling liberated. As a donor, the approach of communication through touch: to look, feel unconditional love and accept the other as he is with his fears and worries – I was transitioned into another dimension and learned patience and slowness and to be available to the other. This also refers to limits and what works in order to be fully available to the other. Thank you to Mal and Kate for sharing this beautiful experience! ================================================== J’avais pratiqué quelques massages de bien-être et reçu beaucoup de massages ayurvédiques. Je me suis inscrite à la formation détox d’une part pour découvrir et d’autre part pour accompagner mon mari (praticien ayurvédique). Je ne savais pas exactement à quoi je m’attendais, le programme est une chose, la pratique et le ressenti une autre. De plus, je ne maitrise pas totalement la langue anglaise (compréhension des accents différents) et s’intégrer dans un groupe, pas si simple ! I had practiced a few massages wellness and received many Ayurvedic massages. I enrolled at the detox training firstly to discover and also to accompany my husband (Ayurvedic practitioner). I did not know exactly to what I expected, the program is one thing, practice and feeling another. Moreover, I do not totally mastered the English language (understanding different accents) and integrate into a group, not so easy! Le programme proposé par Mal, accompagné de Kate son assistante fut à la fois progressive et soutenu et permet une mise en confiance. Un profond respect de chacun dans ce qu’il est et ce qu’il peut donner à ce moment-là a permis de travailler et progresser dans cette ambiance. Le groupe et sa dynamique était également porteur. Les supports des premières journées aident à la compréhension et les démonstrations vivantes à s’approprier techniques et mouvements. The program proposed by Mal, accompanied by his assistant Kate was both gradual and sustained and allows confidence building. A deep respect for everyone in what he is and what he can give the time allowed to work and grow in this environment. The group and its dynamics was also carrying. The supports of the first days to help understanding and live demonstrations to appropriate techniques and movements.! J’avais une approche psychologique des émotions (formation, thérapie), je n’imaginais à quel point les émotions peuvent s’inscrire dans les cellules, se nicher et éclater telle une boite de Pandore. J’ai reçu un massage de plusieurs heures par un des participants. L’énergie flottait et circulait dans tout le corps et dans la zone pelvienne telle une boule de feu qui s’est exprimé de différentes manières. A la fois dans une grande présence et un état quasi de transe, je n’ai jamais ressenti autant d’énergie circuler dans le corps et autour du corps. I had a psychological approach to emotions (training, therapy), I imagined how emotions can enroll in cells, nesting and burst like a Pandora's box. I received a massage several hours by one of the participants. Energy floated and circulated throughout the body and in the pelvic area as a fireball that was expressed in different ways. In both a great presence and a quasi state of trance, I have never felt so much energy circulating in the body and around the body. En tant que receveur, j’ai pu revivre des émotions telles que la tristesse, la joie, la colère et les faire ressortir en recevant le massage du yoni. Au sortir du massage, j’avais une sensation à la fois d’épuisement et de transformation de l’énergie : j’avais lâché, voire régressé pour me sentir libérée. En tant que donneur, l’approche de la communication par le toucher : se regarder, se sentir, ressentir de l’amour inconditionnel, accepter l’autre tel qu’il est avec ses peurs, ses inquiétudes m’ont ouvert une autre dimension et appris la patience et la lenteur pour être disponible à l’autre. Ca renvoie également à ses limites et a ce qui est à travailler pour être totalement disponible à l’autre. As a receiver, I could relive emotions such as sadness, joy, anger and bring out receiving massage yoni. At the end of the massage, I had a feeling both exhausted and transformation of energy: I let go or even regressed to feel liberated. As a donor, the approach of communication through touch: to look, feel, feel unconditional love, accept the other as he is with his fears, worries me open another dimension and learned patience and slowness to be available to the other. It also refers to its limits and what is working to be fully available to the other. Pour moi, c’est une découverte balbutiante des possibles du corps humain et de la dimension thérapeutique de ce massage à travers le body workshop. Il faut pratiquer, sentir, accompagner, être en présence, jouer de ses polarités énergétiques et continuer à apprendre de soi-même. Pour moi-même c’est continuer à explorer pour atteindre une joie plus profonde. Merci à Mal et Kate pour ce partage. Hi Mal, I owe you an outstanding Testimonial...: Mal can see the beauty and sacredness in you even if You have refused to see it. He will open his own heart wide so you can learn to open yours and bring the love you created back to your own heart to nourish your life and relationships. He will understand your darkest emotions whatever they are. He will inspire you and help to empower yourself so you can release and work with your fears safely. You will feel the unconditional love flowing through his eyes and his hands to assist you at transforming your wounds in your heart and body. When you trust you can be yourself again, let the Shakti energy within you awaken. And speak your truth. Well, it was a very comprehensive experience for me. Through practice, we learned useful, powerful and advanced techniques with deep meaning and beneficial effects. 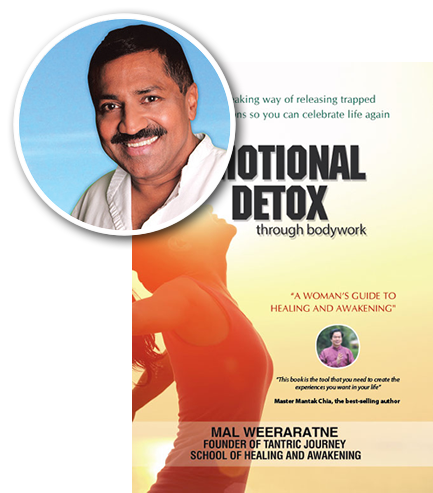 Emotional detox by Mal I find as one of the strongest ways how effectively look after our health - physical and emotional. Mal also paid close attention to our feelings and wellbeing and we created nice and safe space for our healing, learning and for building our awareness. On top of that and even though I had a wonderful relationship with my boyfriend before I attended the Teacher Training Course, after completing it, our relationship went to a higher level of conscious mutuality and my Joni feels even more alive and able to feel and hold more pleasures. I take this opportunity to thank mal for conducting great teacher training programme. I met so many teachers during my journey but I was really impressed by mal s knowledge, especially emotional release through Tao and body work.im deeply honored and humble to get citified as a one of the fist tantric educator under great teacher like mal. I highly recommended teacher training programme. Mal has empathy, unconditional positive regard most importantly he has love for everyone. When a friend recommended last year that I have a session Mal, I thought I'd just go once and that'd be it. However, I've begun a journey that I could never have imagined. The safe and loving healing space that Mal offers is helping to take away layers of emotional and physical 'armour' which had kept me alone for long periods of time, and not able to open deeply to relationship with men. After a recent session I realised that I'd spent years developing my career as an excuse not to face past trauma, hoping that it would somehow go away. I've been really moved to learn that about 70% of women are affected by physical/emotional issues (in my case, experiences from childhood and serious illness as an adult) which prevent them from experiencing deep intimacy and love from men. I highly recommend going to one of Mal's talks to learn more about this, including scientific evidence about how we store trauma in the body, and how his practical bodywork approach can be so much more effective than talking therapies. Tantra, in it's truest form, is about giving and receiving unconditional love, and clearing the energy centres (chakras) in the body to awaken our spiritual essence and vital lifeforce. My body is starting to come alive again through the sessions with Mal, and it's something I would wish all women to experience - to be in the beautiful sacred fullness of their sexuality, and be comfortable with that. Mal is an amazing healer. He has great knowledge and skills to release the body from past trauma. If you have any chance to meet him go to Rasayana. for his master class. Being in his Dakini training in London has given me great insight about de-armouring the body and how to free the body from what's keeping us from living an empowered life. Mal himself is loving kindness and has an amazing passion in his work as a tantric healer. Its a joy to work with him. After having a break from an eight year marriage, I was faced with the decision to either practice Tantra here in the UK (London to be more precise) or fly to the south east. The far east was my first choice with the promise of leaving behind the past and to retreat in the sun by the sea which did not seem like and still to this very moment not the worst plan to date, so I have spent a few weeks in London attending various workshops, group therapy where the dynamic has facilitated the spontaneous exchange and expression of long-buried feelings through the use of bodywork and movement therapy using touch, massage, bioenergetics exercises to help release stored emotions in internal pathways, for maximum flow by shifting internal chemicals to attain natural balance. This is why the principles of Tantra and the teachings have attracted me. In addition Tantra helps develop the masculine and embody the divine feminine goddess with these polarities undeveloped from childhood. So after eight years, I have been able to reflect and see why the relationship failed and why many others do. We are all experiencing similar experiences with a slightly different cause, but I will delve into this personal experience at a later date, as I will have to back track. But now I want to address and recognize where I am and what I need to confront, and I will be sharing this part of my journey with you. I recently attended an introductory workshop to Tantra with Mal, the founder of Tantric Journey. The information shared and communicated in the workshop resonated with the teachings I have previously come to accept through my own fortunate experiences and teachings. Therefore, my intention for visiting was to gain further insight on the training one must complete or ashrams one is required to attend as I am embarking on my very own journey, and have the desire to practice and facilitate for the sole purpose of universal consciousness. Though i am not fond of labels, I feel I would fit the role of a Dakini well encompassing my own creativity. After the workshop I found myself asking these questions and due to my honest nature I attempted to communicate the reasons/my past experiences that led me to this workshop, and ask these questions to begin with. After reflecting on my marriage and discovering the reasons for the friction and conflict I feel, it is my duty to share with you in the hope that if you too are confronted with a similar situation, it is better to begin the initialisation of oneself before coming together in a sacred union. So after my personal experiences with my teacher, an opportunity presented itself. Mal the founder of Tantric Journey suggested I would gain further insight into the practice in exchange for keeping a journal and taking notes of my journey hereon-in to contribute to others who find themselves treading this path. Initially I was taken aback as my teacher was willing to share with me these teachings without much or any expectation! I still find this difficult to digest as nowadays society will not do so but without further deliberation I got to experience my first encounter with Mal and more importantly with myself! As an individual I am fairly open minded. My father always questioned the society and has challenged me to ask similar questions. I have suppressed many emotions since childhood and have buried them for some time now, and as a result destroyed many meaningful relationships and will continue to if I choose not to recognize and accept. I shared most of this with my teacher and he was extremely receptive, and I too will facilitate this through my own creative experience. Wow, My body instantly recognised that Mal is a very learned and experienced practitioner. It was so easy to surrender to his powerful bodywork and gentle manner. I had lots of emotional release happening, it was a profound experience. I plan to go back for more as I've felt better than ever generally and much more open to pleasure since our first session.